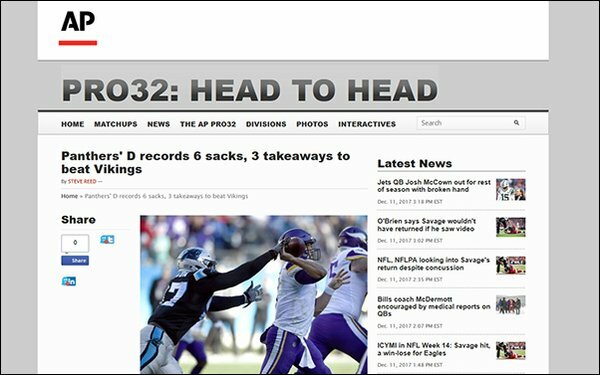 Partnering with Arkadium, the Associated Press will begin to use the company’s InHabit artificial intelligent tool to add interactive content to its sports verticals. InHabit uses AI to scroll a page’s content, culling data from the article that it then cross references with a library of pre-developed editorial units called factives created by a team of in-house InHabit editors. The factives are interactive templates of sorts that can be populated with relevant content from an article. The AP is using these factives as a way to engage readers across its sports verticals. For example, a recent story about Steelers’ quarterback Ben Roethliesberger was accompanied by an interactive quiz asking the reader to guess which NFL quarterback had the most passing yards this season. Jessica Rovello, CEO, Arkadium, sees many possibilities for this kind of content to be used by publishing partners like the AP and to drive revenue in the process. She told Publisher’s Daily: “When considering revenue streams, we naturally gravitated to advertising and specifically branded content. Branded content’s primary challenge is efficiently scaling organic engagement. The AP will continue to roll out the new interactive components. For now, Arkadium’s involvement with the AP is exclusive to its sports verticals. Arkadium has worked with more than 500 publishers internationally, like CNN, The Washington Post and TMZ. The sports spots are its first partnership with the AP. Previously, the AP used AI from Cortico, a media analytics nonprofit at the Laboratory for Social Machines at the MIT Media Lab, to measure how much attention was paid to the president’s tweets and how users on the platform responded. In 2013, the news outlet partnered with another AI firm to teach software to write short news stories. By 2015, the software was writing 3,700 short-earning stories each quarter. The company found it freed up its reporters to write more in-depth pieces. Other outlets, like The Washington Post, have also explored this avenue of content generation. 4 comments about "AP Uses AI To Enrich Sports Content". Chuck Lantz from 2007ac.com, 2017ac.com network, January 19, 2018 at 12:39 p.m. I guess the next step is an app that will add random typos to those AI-generated articles, to give them that "human touch", like the shaky-camera video production apps that mimic handheld? Aside from that, how do we know that this article isn't AI-generated? Sara? Are you a real person? John Grono from GAP Research, January 19, 2018 at 5:30 p.m.
Are they having a laff? So you subtract last years yardage from this years, pop it on a screen ... bingo ... there you have it ... AI. Well you could knock me down with a feather because I was doing that back in primary school. Chuck Lantz from 2007ac.com, 2017ac.com network replied, January 19, 2018 at 5:39 p.m.
John: Are you saying that AI isn't very I after all? John Grono from GAP Research, January 19, 2018 at 6:07 p.m. I was working on AI, predictive analytics, econometric attribution modelling etc. 15-20 years ago. There is definitely a lot of 'I' in it, and sometimes some 'A' (but I don't mean 'artificial'). What I do find is that sometimes, some of those that have just discovered AI can let their 'E' (enthusiasm) dominate their 'I'.